animals helped; 12,000,000 healthy meals provided. Don’t Forget! 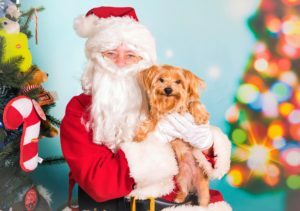 Come see us tomorrow, Saturday 11am-2pm, for Photos With Santa, hosted by Three Paws Neighborhood Pet Supply, 3147 SW Moody, Portland, 97239. These photos are absolutely out of this world great, the cost just $20. And for that $20 you’ll get a super high-quality digital image, entry into an enormous raffle, and for the first 40 people, a gift bag that will knock your socks off. But that’s not all. Because every penny will be donated to charity to help feed hungry animals. And every $20 means another 200 meals for the hungry animals. Plus we’ll have a Santa Special with $25 Pongo hoodies! Remember, it’s Saturday December 1st, 11am-2pm, Three Paws Neighborhood Pet Supply, 3147 SW Moody, Portland, 97239. Call with questions, 503-719-5204. The Pongo Fund is honored to be included in the 2018 Willamette Week Give!Guide. Click the logo above to donate to our award-winning group. them safe, healthy and out of the shelters. The Pongo Fund is an award-winning, volunteer driven 501c3 public charity and donations are tax deductible. We love animals and we love people and we do all we can to keep them together by providing quality food and vital veterinary care to anyone in honest need. 120,000 animals helped, 12,000,000 meals provided. © The Pongo Fund. All Rights Reserved.